These are the specs of the model that Lenovo sent me. Obviously, there are higher-end options. You can have the display configured up to 1440p, and you can also get it with a 2GB Nvidia GeForce MX150 GPU. Unfortunately, the dedicated GPU is only available on models with a vPro CPU. The design of the ThinkPad T480s is kind of a combination of the X1 Carbon and the X1 Yoga. 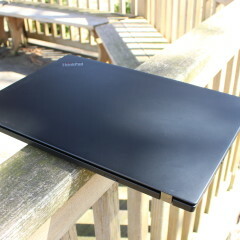 The body itself is similar in shape to the X1 Yoga, while it's a standard laptop made of carbon fiber, like the X1 Carbon. 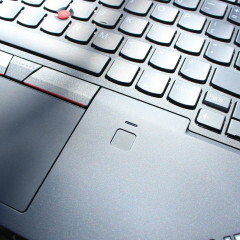 Like most ThinkPad laptops, it includes a round power button next to the keyboard, and a fingerprint reader beneath it. 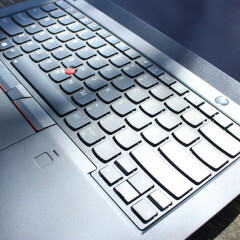 You'll also find that the keyboard has a bit more depth than on the convertibles. The ThinkPad T480s has no shortage of ports. 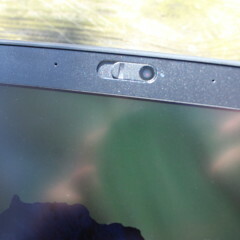 On the right side of the device, you'll find a single USB 3.0 Type-A port, a Smart Card reader, and a Kensington Lock. 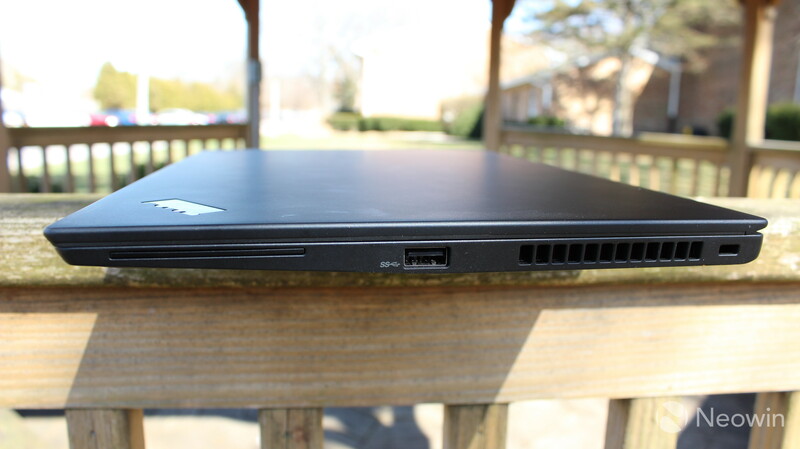 On the left side, there's an additional USB Type-A port, a 3.5mm audio input/output jack, Ethernet, a 4-in-1 card reader, and two USB Type-C ports. The Type-A port is always on too, so you can use it to charge a device even if the PC is turned off, which is always useful. 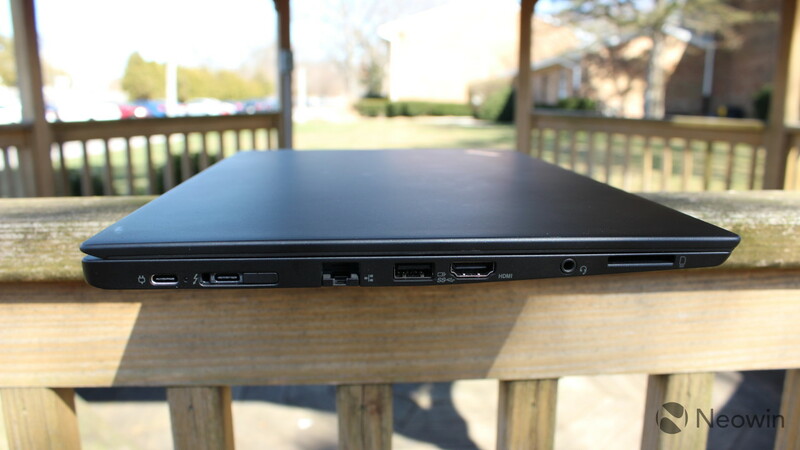 The USB Type-C port that stands on its own is USB 3.1 Gen 1, meaning that it can handle data transfer of up to 5Gbps. 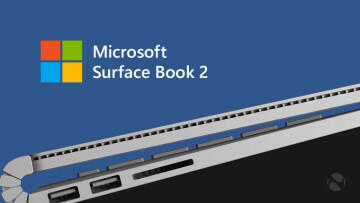 The other Type-C port is Thunderbolt 3, and while both can be used for charging the PC, this port is designed for physical docking. Just in case the ports offered to you aren't enough, this PC is quite expandable. 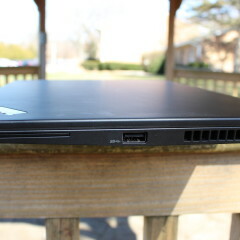 The Lenovo ThinkPad T480s comes in at about 2.9 pounds, another similarity that it has to the X1 Yoga. That's almost a half-pound heavier than the X1 Carbon, but it's still much lighter than the T480. Unfortunately, the main thing sacrificed from the T480 to the T480s is the removable battery. 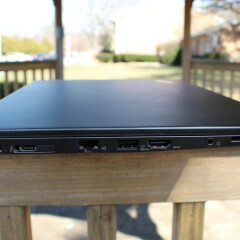 The model that Lenovo sent me includes a 1080p IPS LCD with multitouch. It's available without touch, and with a 1440p resolution. The aspect ratio of the screen is 16:9, which is my personal preference, but it's not for everyone. 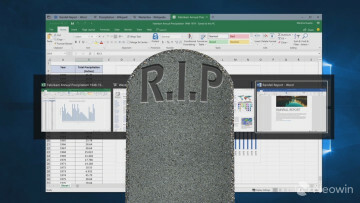 It seems that 3:2 screens are becoming more popular across the board, a trend started by Microsoft's Surface PCs. I like the wider 16:9 aspect ratio because it makes more sense for splitscreen work. If you're into video editing or something else that would benefit from a taller screen, you might want to look for something that's 3:2. The matte screen isn't the prettiest thing in the world. 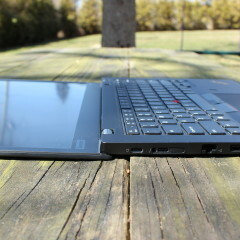 After all, it's a ThinkPad that's meant to be something of a workhorse. The anti-glare screen is great for getting work done in bright areas, and that's the benefit of not having such a glossy display. 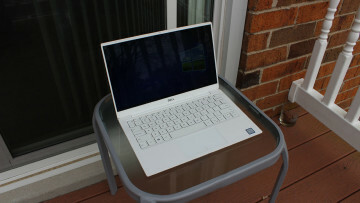 I would suggest paying a little bit extra for the 1440p model, if you don't mind a slight hit in battery life. The higher resolution can definitely come in handy. 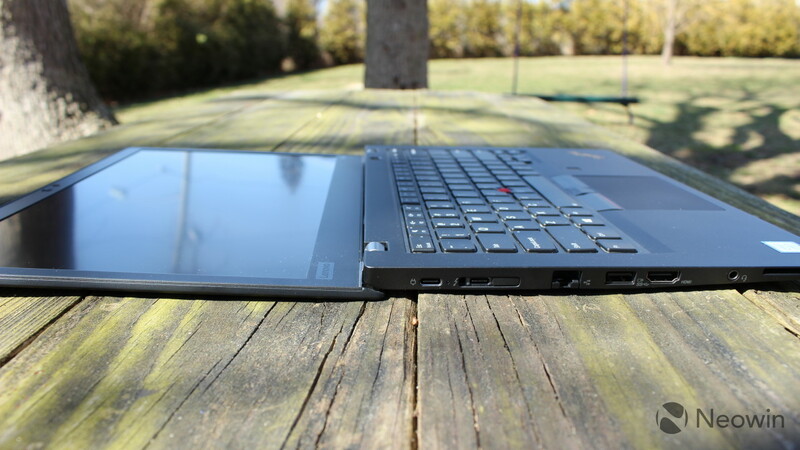 Lenovo always includes wonderful keyboards in its ThinkPad laptops and convertibles. The keys aren't too shallow, and there isn't too much or too little resistance. It's just right. I especially like the carbon fiber models because the soft feeling around the keys is pleasant to use. Being that I type for a living, you can only imagine just how important a good keyboard is to me. 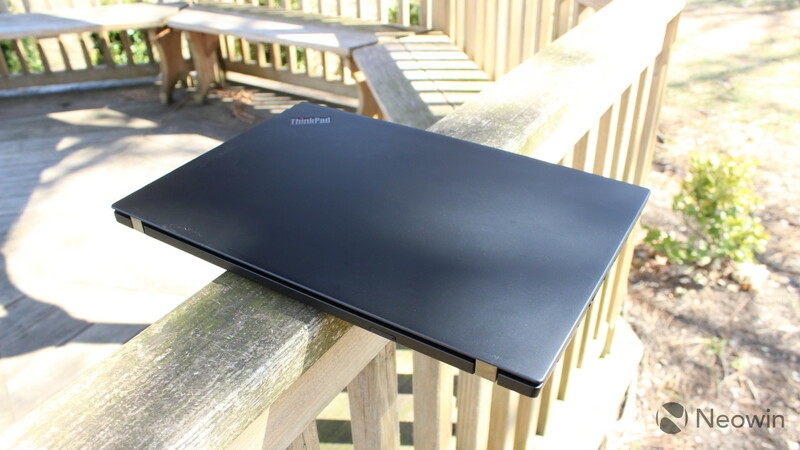 I cannot stress this enough when I say that ThinkPads consistently have the best laptop keyboards on the market. 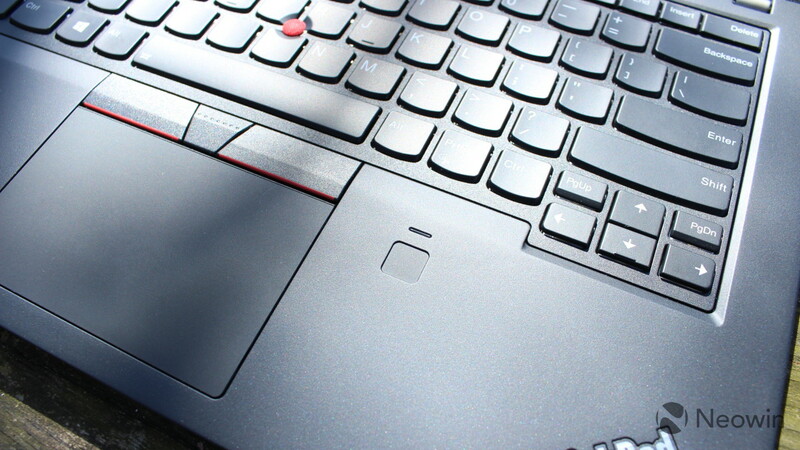 As usual, there are various methods of navigation, including a trackpad and the famous TrackPoint, which is the red nub wedged between the G, H, and B keys. 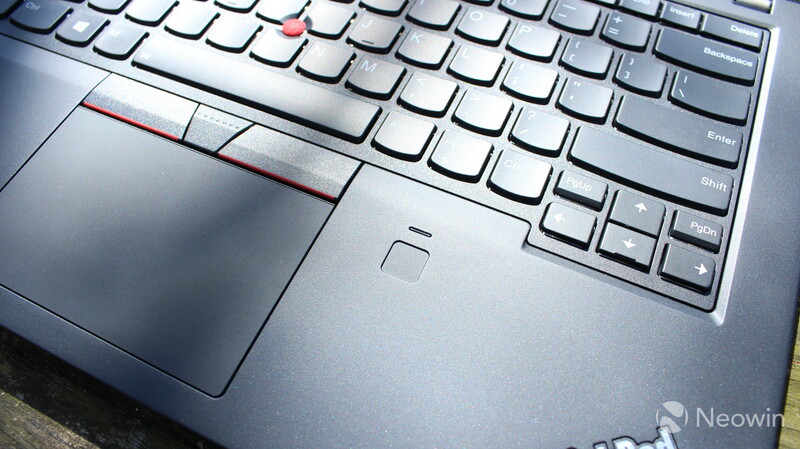 The trackpad is clickable; however, there are also three buttons above the trackpad. Obviously, the left and right buttons are for left- and right-clicking, respectively. 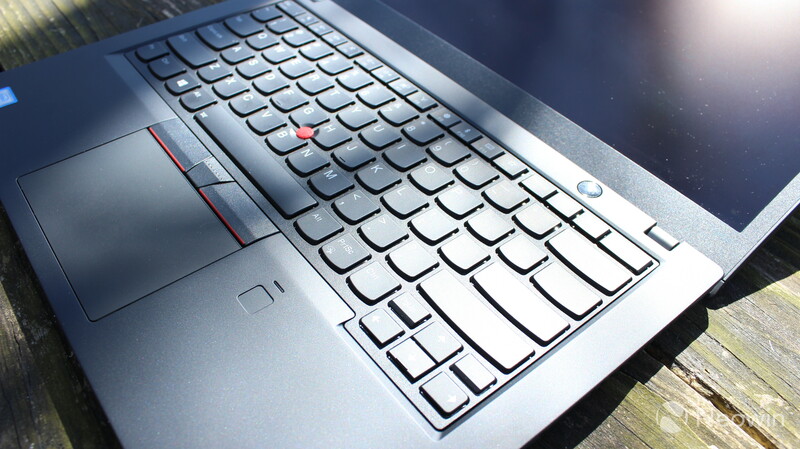 The center button is for scrolling, so not only can you use the TrackPoint for moving the cursor, but you can also use it to scroll through a window by pressing the center button. Personally, I'm a mouse guy, although I've recently come to respect the TrackPoint. Given the choice between that and a traditional trackpad, I'd take the TrackPoint. 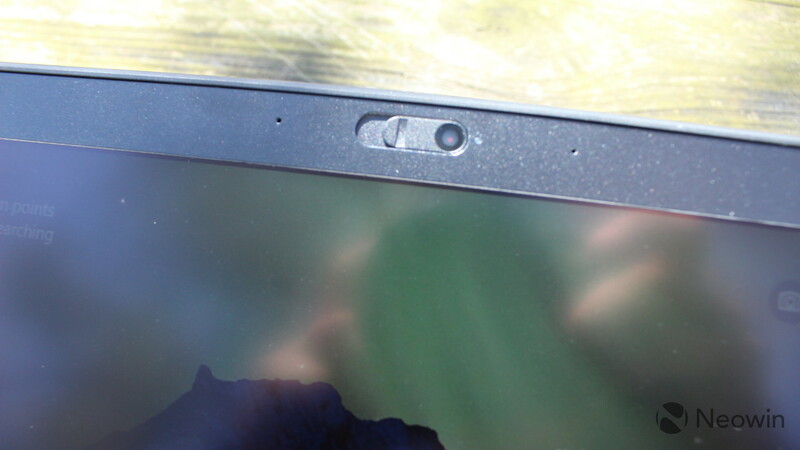 Two wonderful new features that Lenovo added to this year's ThinkPads are an IR camera for Windows Hello facial recognition and a privacy guard on the camera called ThinkShutter. There's only one problem, which is that you can't get both on the same model. I think that facial recognition is the best kind of recognition, at least for a PC. After all, you're sitting in front of it, so it only makes sense for it to recognize you. Lenovo has used fingerprint sensors for biometric authentication since long before Windows Hello was even a thing, and this continues to be standard. While I appreciate that the company is finally using an IR camera in at least some models, I'd love to see it on all of them, or at least have it as an option on all of them. ThinkShutter is a great idea as well. No longer do people have to put a piece of tape over their webcam for privacy, as users of the ThinkPad T480s can simply flip a switch at the top of the display. This is a technique that's becoming pretty popular across the PC market. I just wish that users had the option to get both the ThinkShutter privacy guard and an IR camera for Windows Hello. Lenovo told me that they hadn't quite worked out a way to get the ThinkShutter privacy guard to cover the IR camera, and that it ran into some issues. Hopefully, this will all be worked out by the next round of ThinkPads in January. The Lenovo ThinkPad T480s has four choices in CPU: Core i5-8250U, i5-8350U, i7-8550U, and i7-8650U. The main difference between each Core i5 and Core i7 is that the one with the higher number has vPro, and the other does not. The model that Lenovo sent me has the i7-8550U, so there's no vPro. That also means that this model isn't eligible for the 2GB Nvidia GeForce MX150 GPU. 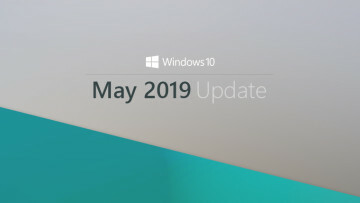 Instead, it uses Intel UHD Graphics 620, meaning that it borrows graphics memory from system memory, rather than having its own dedicated memory. 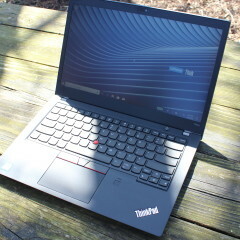 I really only used the Lenovo ThinkPad T480s for productivity-related tasks, and performance was great. My general workflow includes having about a dozen tabs open in Chrome all the time, along with Slack, Skype, OneNote, and the occasional Photoshop. Battery life is pretty good too, and I don't think that you'll have any issues with getting a full work day out of the T480s, or around eight hours. As is always the case with battery life, your mileage may vary, especially if you do heavier tasks like playing games or editing video. For benchmarks, I used PCMark 8, which provides three tests: Home, Creative, and Work. 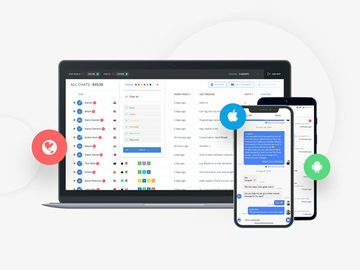 The Home test checks common tasks like web browsing, casual gaming, photo editing, video chat, and more. As you can see, the score on the Home test is average. 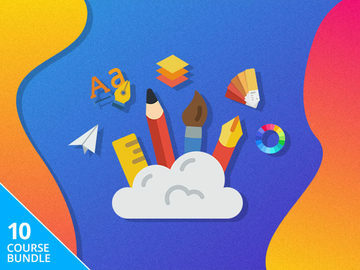 The Creative test checks more GPU-intensive tasks, like serious gaming, video editing, and more. Obviously, there's no dedicated GPU in this machine so you shouldn't expect any higher score on the Creative test. Finally, Work tests productivity-related tasks like writing and spreadsheets. 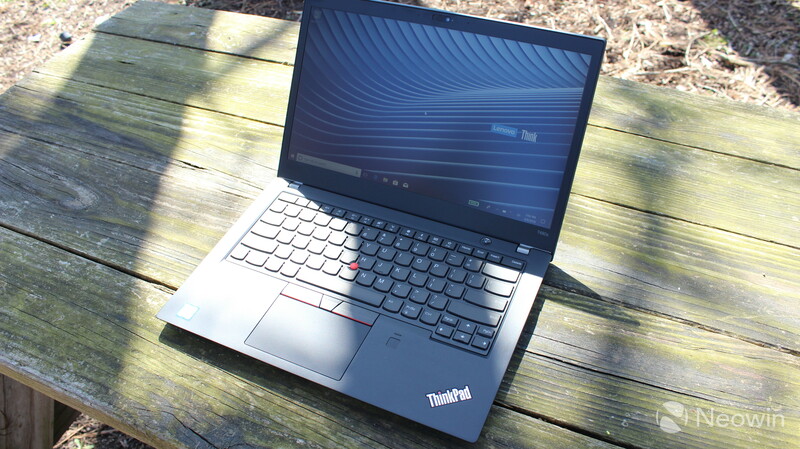 As usual, ThinkPads are engineered for productivity, so it's no surprise that the T480s scores so well on this test.